Another typical church wedding turned extraordinary earlier today when I was blessed to document the wedding of Jennifer and Steve Long at the First United Methodist Church in Dade City, FL. For starters, Dade City is picturesque enough on its own. Then as if an anointed church was not enough, both the bride and groom turned out to be spiritual examples for a whole new generation to learn from. God’s plan for today not only included a phenomenal couple and their guests, our divine Father’s will turned out some of the most incredible church exterior shots I ever captured in photographs at a wedding. I thank the Lord for such phenomenal photo opportunities and for the unraveling on His plan for my life as a wedding photographer. Today at the First United Methodist Church of Dade City, I came face to face with a wave of creativity made possibly by, of all things the weather and a building. If you are contemplating having your wedding at the First United Methodist Church in Dade City, FL then don’t hesitate to book your date ASAP since this church is typically booked 2 years in advance during their busy months which are spring and fall. 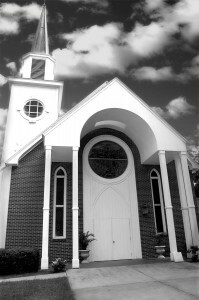 Posted in Weddings and tagged Dade City, First United Methodist Church, FL, Methodist Church, photographer, photography, wedding, wedding photographer.